Create cozy warm whites to relax after a long day or energetic bright whites when you need a boost with Kasa Smart's tunable white LED light bulb. Tune the appearance from a soft white to a bright light. Kasa Smart's tunable white LED light bulb connects to your home's secure Wi-Fi network. No need for a hub or extra equipment. 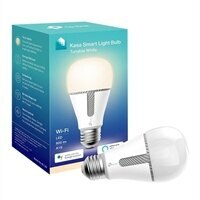 Control your smart light bulb from anywhere with your smartphone using the free Kasa Smart app (iOS, Android). Turn your light bulb on if it's getting late so you'll arrive to a well-lit home. Use simple voice commands to control Kasa Smart's tunable white LED light bulb with any Alexa, Google Assistant or Microsoft Cortana. Just tell your voice assistant to turn the bulb on and off or set schedules so it turns on when you wake up or to a soft white when you want to relax. Set your bulb to automatically adjust its color temperature to match natural light patterns from dawn to dusk. Use your Kasa Smart app to schedule your light bulb to automatically switch on and off when you're home or away. Combine all your lights with other Kasa Smart devices in a Scene and control them at your fingertips. The Title 20 and Energy Star certified light bulb reduces consumption without losing brightness or quality, while saving you money.